Eaton captures the danger, emotions, and political landscapes of the Vietnam War in this extraordinary story of heroism. No one exemplified the utter danger and downright dirty work of the Vietnam War more than the combat infantryman. 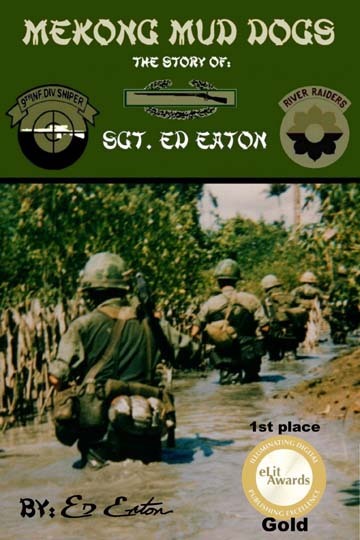 Ed Eaton lived his own remarkable combat role, and in his memoir, Mekong Mud Dogs, he tells it the way it was. Eaton’s attention to detail and the compelling nature of his war story do not disappoint. Eaton tells the story (also documented on the History Channel and the National Rifle Association’s Life of Duty Channel) of his extraordinary heroics on April 3, 1969: After a night raid, Eaton’s chopper was shot down. Severely injured, he fired on advancing VC troops from atop the downed chopper, changing weapons often. He thwarted the attack until backup arrived. Eaton was awarded several Purple Hearts and has also been recommended for the Medal of Honor. The book suffers from having been written over a period of many years and from an evolving perspective. Some of Eaton’s most important personal insights come only as a postscript to his narrative. Eaton could achieve a unity of purpose, and perhaps attract a wider readership, by updating this memoir to incorporate the scars and the healing from the point of view of the survivor he is today.